National public health institutes (NPHIs) help many countries around the world carry out essential public health functions and ensure accountability for public health resources. Globally, NPHIs serve as homes for countries’ public health systems and expertise. The U.S. national public health institute is CDC in Atlanta, but many other countries have – or are developing – their own institutes. Building on more than 70 years of experience, the Centers for Disease Control and Prevention help countries around the world develop and strengthen their own organized, well-functioning NPHIs to protect the public’s health and contain disease close to the source. 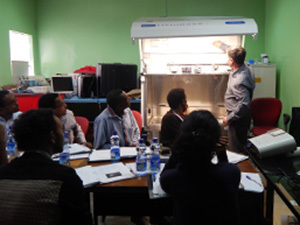 With support from the NPHI program, staff from the Ethiopian Public Health Institute learn how to test in-flow and down-flow on the biosafety cabinets. NPHIs address these issues through consolidating public health functions at the national level, bringing together data and expertise while coordinating efforts across sectors. By offering guidance and support to countries who are developing or strengthening their own NPHIs, CDC helps countries become better equipped to collect and use public health data; plan, implement, and monitor public health programs; and, ultimately, save money and protect lives—both overseas and at home in the United States. CDC’s role in NPHI development is to provide technical expertise on essential public health functions and is targeted to a country’s public health priorities. In addition, CDC’s engagement may focus on sub-national public health entities that make up a country’s public health system. One size does not fit all. Institutes vary in size, scope and availability of resources, and CDC’s role varies based on the context in which we are working. Learn more about where we work. In addition to Ministries of Health and host country governments, CDC partners with the International Association of National Public Health Institutes (IANPHI) on development and strengthening activities. Learn more about our partners. Core functions of NPHIs include: Population health assessment, surveillance and response, research, health education/health promotion, and public health workforce development. The CDC NPHI program has worked with over 20 countries and 1 entity on NPHI creation or enhancement since 2011. We partner with centers and units all over CDC to draw upon subject matter experts in the areas most important to partner countries. We work closely with the International Association of National Public Health Institutes (IANPHI), who maintains a membership of more than 100 NPHIs in nearly 100 countries, reaching more than 6 billion people worldwide.